Throughout the history of the science fiction and horror genre of film and literature, there have been stories that hold a mirror to the realities of our world. Through fantastical plotlines, socio-political themes such as corruption, sexism, racism, and a general questioning of the status quo have been explored. From George A Romero’s zombie feature Night of the Living Dead, that touched on race and xenophobia, to the Star Wars franchise, that continues to challenge ideas of war and totalitarianism, these kinds of movies have often been used as a space to touch upon issues that aren’t far removed from the problems moviegoers of the real world face. John Goodman as William Mulligan and Gabriel Drummond as Sanders. 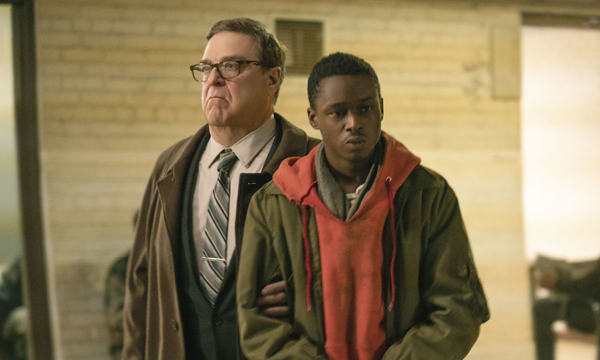 The science fiction horror film Captive State continues in that vein by using the plotline of alien invasion to highlight issues of race and class in today’s society. It’s an ambitious effort that produces mixed results. Produced by Participant Media, distributed by Focus Features, and directed and co-written by Rupert Wyatt (Rise of the Planet of the Apes), the film stars John Goodman (Kong: Skull Island), Ashton Sanders (The Equalizer 2), Jonathan Majors (Hostiles), Machine Gun Kelly (Bird Box), and Vera Farmiga (The Conjuring). The plot of the film deals with a race of aliens, referred to as the “Legislators,” who have invaded Earth and seized control. They work with the wealthy and political elite to oppress the rest of humanity. In response to this extreme form of inequality, some humans have mounted a rebellion, forming a group called Phoenix, aimed at overthrowing the aliens and sparking a revolution. The action in the movie unfolds over the course of a week, mostly in Chicago, where the rebel group is mounting a major attack on the Legislators. Two central figures in the narrative are Gabriel Drummond (Sanders) and William Mulligan (Goodman). Gabriel is a young Black man who finds himself at the centre of the rebel group’s plan, as his brother is one of the leaders of Phoenix. William is a cop who helps to maintain order for the Legislators; he has a direct personal connection with Gabriel. This interpersonal relationship, along with their opposing political affiliations, creates a push and pull relationship that is a major focus of the film. It’s also one of the highlights of the movie, as it adds an emotional connection to all the action and political espionage that happens in the story. There are a number of things that Captive State has going for it. One being the use of the backdrop of Chicago for the central hub of the resistance fight. The city has a long history of political battles with working class people at their centre. One of the most famous was the Haymarket Affair, which involved a labour demonstration on May 4, 1886. Workers, then subject to unbearable conditions on the job, were striking for an eight-hour work day and in protest of police killings of working people. The affair resulted in the framing and execution of four activists. This event had lasting effects on the state of the labour movement not only in Chicago but around the world, as it became the inspiration for May Day – observed everywhere else but in North America as International Labour Day. Yet, despite those highlights and strong messages, there are some drawbacks to the film. Although interpersonal relationships are crafted that allow the audience to become invested in the stakes of the resistance fight, there are large chunks of the movie devoted to action sequences with characters that viewers aren’t given enough time to care about. Gabriel is a central character, and we are made to be invested in his (and William’s), story, yet there are portions of the movie where they are completely off-screen. In that time, we are shown characters who have little to no dialogue, and we know little to nothing about. We know they’re in the resistance, but we aren’t told why or what is at stake for them. This then makes the action sequences, and dangerous atmosphere, anti-climatic, as viewers may find it hard to muster joy or fear for the triumphs and failures of these mostly unknown characters. There are parts of the movie where characters get into conversation about what it means to resist instead of going along with the status quo, but the number and depth of those moments pale in comparison to the movie’s tendency to lean on chase sequences and rebel strategy planning. This seems like another missed opportunity to dig into what motivates some people to rebel while others would stay confined to their current lives under the rule of their outer-space colonisers.